BARCELONA, February 13, 2011 – Samsung Electronics Co. Ltd., a provider of smart media devices and the global leader in Android™ tablets, in partnership with Vodafone Group, today announced the Samsung GALAXY Tab 10.1 (Model: P7100), a powerful Dual-Core Android 3.0 (Honeycomb) Smart Media Device, designed to deliver the ultimate mobile entertainment experience. "As a leader in the Android-powered tablet market, Samsung is committed to providing a variety of feature-rich, always-on devices" said DJ Lee, Executive Vice President and Head of Sales & Marketing. He continued, "The Samsung GALAXY Tab 10.1 is a valuable addition to our expanding portfolio of smart media devices. Sporting a large 10.1 screen and dual surround-sound speakers, it enables users to enjoy multimedia to the maximum extent without having to compromise mobility. Patrick Chomet, Vodafone's Group Director of Terminals, said: "Vodafone customers in over 20 markets around the world will be the first to get the GALAXY Tab 10.1 when it goes on sale this spring. Samsung have produced a stylish, market-leading implementation of the new Android 3.0 platform which will be the first Honeycomb device to arrive in many of those markets. 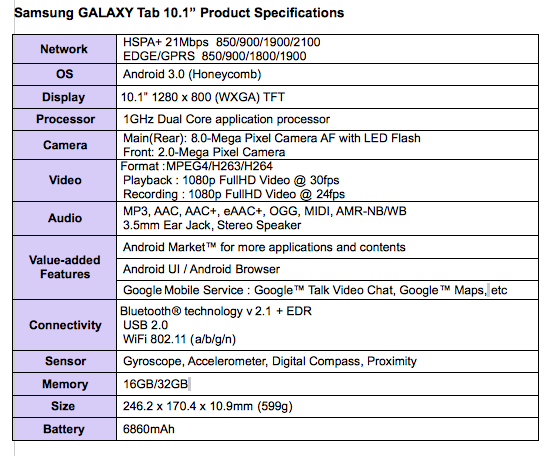 Vodafone's competitive data tariffs and reliable, high-speed networks make using the GALAXY Tab 10.1 a great experience." "Samsung continues to develop innovative products that contribute to the continued growth of the Android ecosystem," said Andy Rubin, Vice President of Engineering at Google. As the tablet market experiences unprecedented interest, Samsung and Vodafone have partnered to cater to customer demand and offer them the perfect way to enjoy the huge variety of opportunities the Android platform provides. Whether playing games, reading eBooks or updating your Facebook status, the lightweight, ultra-slim Samsung GALAXY Tab 10.1 is the ultimate entertainer and builds on the industry-wide success of the two million-selling Samsung GALAXY Tab. A 10.1" (WXGA TFT LCD) display with crystal clear resolution (1280 x 800) makes the Samsung GALAXY Tab 10.1 an unrivalled device for experiencing the hundreds of thousands of games and applications available from Android Market™. To compliment the amazing visual quality of the device, the GALAXY Tab 10.1 includes dual surround-sound speakers to immerse you even more fully. The device also includes an 8 megapixel rear-facing camera with Auto Focus and a 2 megapixel front-facing camera which lets users capture experiences with the best-in-market full HD record and play as well as easily share them. With the Android browser and Flash 10.1, the Samsung GALAXY Tab 10.1 is the perfect tool for consuming the world of the internet content wherever you are. Combined with the latest version of Android's tablet-optimized operating system, Honeycomb, Samsung has created a device that is powerful and lightning fast. The Samsung GALAXY Tab 10.1 includes a 1GHz Dual Core application processor, giving you the kind of fast and powerful multimedia and web browsing experience. Samsung Galaxy Tab 10.1's Dual Core processor, low power DDR2 memory and 6860mAh battery, make it perfect for task management in an energy efficient way. At just 599g in weight and mere 10.9mm- slimness, the Galaxy Tab 10.1 is lighter, slimmer and more portable, meaning users are free to enjoy its many features while on the move. With the need to remain constantly connected, Samsung has also included super-fast HSPA+ 21Mbps, Bluetooth® 2.1+EDR and Wi-Fi 802.11 a/b/g/n connectivity to support rapid mobile download speeds and reduce data transfer times. 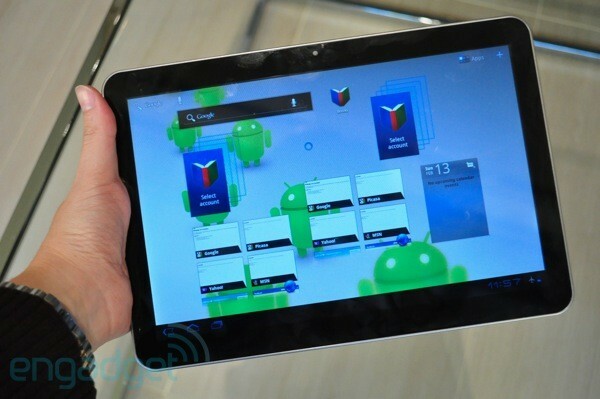 The Samsung GALAXY Tab 10.1 will be exhibited at Mobile World Congress 2011 at Hall #8.